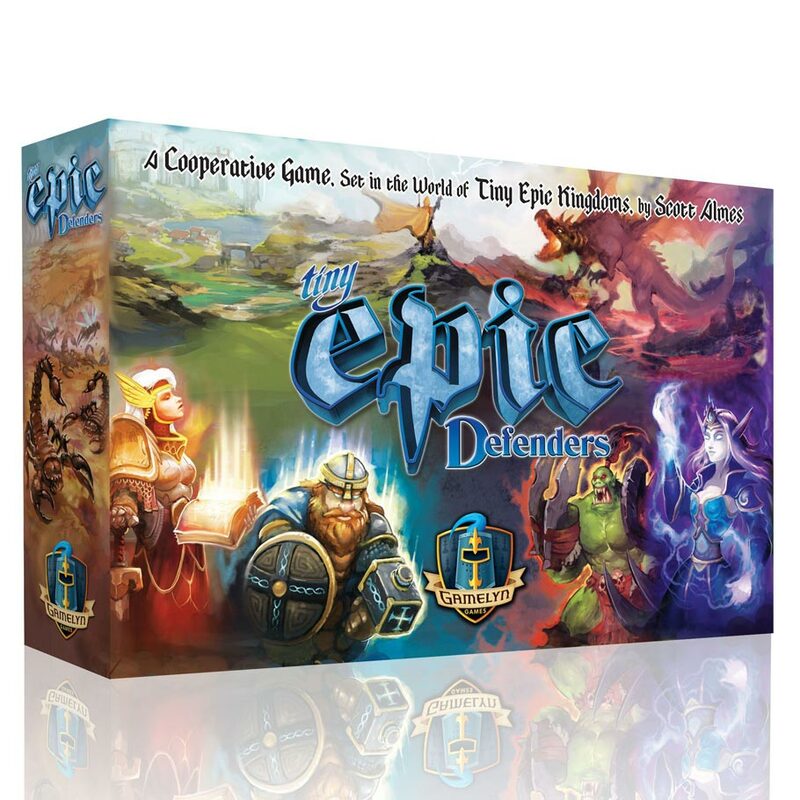 ACD Distribution Newsline: New Tiny Epic Defenders releases from Gamelyn Games! 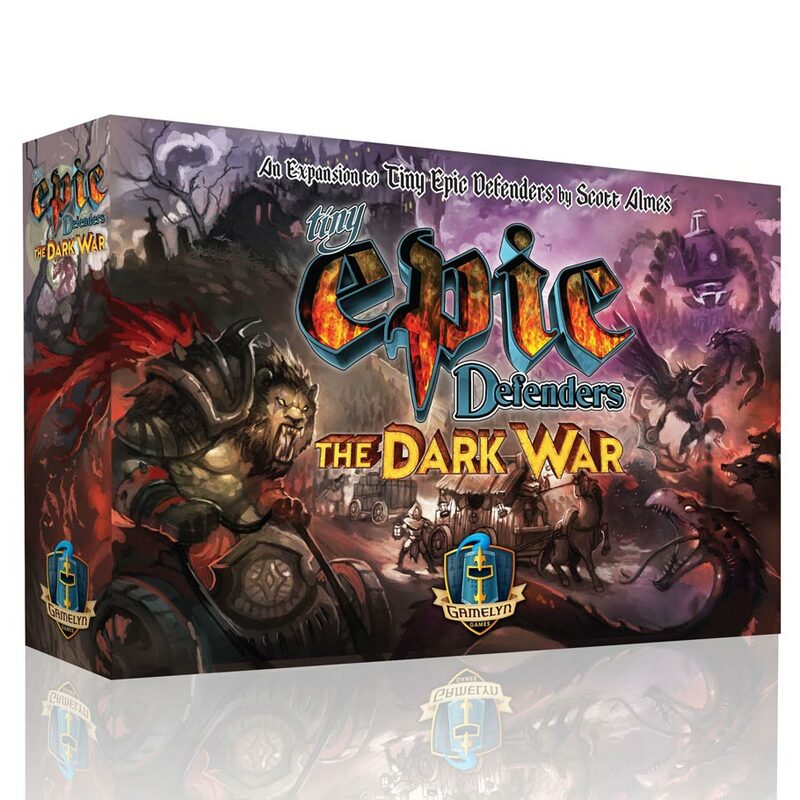 Tiny Epic Defenders: The Dark War, an expansion to Tiny Epic Defenders, is the latest installment in Chronicles of Aughmoore. It introduces new Heroic characters like the Lionkin Charioteer and the Birdfolk Shadow Walker. It also introduces new Epic Foes, new Dire Enemies, and new Artifacts, but more importantly, it introduces new and exciting features that keep players making difficult choices from the edge of their seats. These new features include a Campaign Mode with Enemy Generals, Skills that Heroes can learn, Advanced Regions and Caravans. Caravans represent the shattered homes of villagers during this dark time and are spread across all the Regions. Players are faced with the additional challenge of rescuing these Caravans and escorting them safely to the Capital City before they are can defeat the Epic Foe. Skills are useful abilities players can assign to their Heroes and require Experience Points to activate. Experience Points are now earned during play by making meaningful decisions that help the party reach their goals. The Campaign Mode plays like an evolving gauntlet challenge, where players must play through the game multiple times, facing Generals at the intervals instead of the regular Epic Foe. The different abilities players will have at their disposal, as well as the threats they face, are unique to each Campaign and evolve with the choices players make during each Campaign. If players can survive long enough, they will face an Epic Foe at the conclusion of the Campaign. The Advanced Regions introduce new threats and also new abilities to aid the players in The Dark War. These new threats and abilities come in the way of 3D constructs like a giant Tree Heroes can hide in, a flying Manticore Heroes can ride, or mysterious Sandstorms! They play a big part in the evolving Campaign Mode. Each Advanced Region features a dark, harmful, side and a light, helpful, side. As players progress through the Campaign Mode, they will work to restore the dark regions to their helpful side. Making the right choices to restore these Regions and rescue the Caravans is critical to achieving victory in Campaign Mode. Tiny Epic Defenders is a riveting small-box cooperative game and it's back with an all new edition featuring new art, new abilities, new ITEMeeples® and more exciting gameplay than ever before! New Red Dragon Inn releases from Slugfest Games! New September releases from Osprey! Disney's Villainous! New from Wonder Forge! New September Releases from Thames and Kosmos! Mystic Vale: Havens Event Kit! New from Alderac! Sweet Jenny! New from John Wick Presents! Sonic The Hedgehog Dice Rush! New from IDW Games! New August Releases from Paizo! New August releases from USAopoly! New Fluxx Releases from Looney Labs! New Kromaster releases from Ankama Board Games! New D&D Release from WizKids! New Releases from Brain Games! Trool Park! New from Ankama Board Games! Dice Throne Season Two! New from Roxley Games!